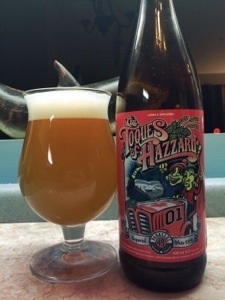 Toques of Hazzard Imperial White IPA is Yee Haw Good! The pour is just extremely foamy and the aroma was kinda stunning. Take one sip of this White IPA and you’ll be shouting like Bo Duke in no time. The label says that it’s hoppy, it isn’t a lie. This may be the hoppiest beer I have ever had. Initially, I was overwhelmed from the amount of hops but that quickly evolved into a very good IPA. This IPA won’t be for everyone; many may find this to be too much flavor which I can totally understand, but it certainly delivers as promised, its hoppy!